Been a while since I've posted on here, and I thought I'd update you all on some of the work I've been doing. I've started selling some assets on the Unity store, mostly generic UI for now but soon I will be expanding to themed content. Thank you! Its super hard to create generic UI assets as most games are themed. It definitely is, takes a lot of skill! All of the best on the Asset Store. Nice work, I really like the crosshairs! Any reason they are only 128x128? You may also want to download an old Unity build and submit it with that instead of 5.3.2. I've kept them small because although they are important, the user is always looking at them. It doesn't take long for a user to get annoyed if a crosshair is in the way of things. Personally I prefer it when crosshairs aren't over complicated in design as it can feel unnecessary - take GTAIV and V for example, they use a simple dot crosshair. I'm busy creating a range of 256x256 crosshairs at the moment, and it is quite a challenge to not overcomplicate or allow them to take up too much screen space. I agree with the intended use, but you're assuming that they would be used as crosshairs. In my case, I'm more likely to use them as HUD elements than actual crosshairs. Fair enough - I actually had a guy wanting to use them for VR - standard size needed to be 1024x1024. Just thought I'd give an update, busy submitting a low poly melee weapon pack to the store. 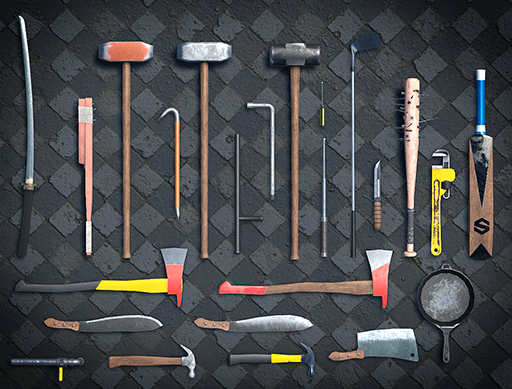 My Low Poly PBR Melee Weapon pack got approved by the Unity asset store - yay! Cool @duncanbellsa! congrats on making product! I've been considering making art asset packages for the store for quite some time, but not sure of the return, Are you finding the whole thing worth while? I need to do some further investigation into how well asset packs do on the store, well done. @Pomb - art is really tricky, hence why I have stuck to generic assets. My most profitable month has been May this year. I spent around 6-7 hours altogether for the 3 packs, and as of last month I have covered my time. It's a nice way to get some passive income. Bumping post again, added in the "Mega PBR Military Prop Pack" to the list.